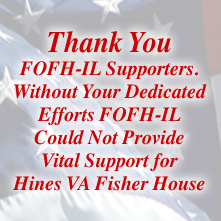 “This kind of continuing support FOFH-IL receives from Post 177 is vital to our mission. We encourage the countless other military organizations in Illinois to follow this Post’s example of ongoing funding on our Member Level of $250 per year,” says Betty Stamatis, Pres. FOFH-IL.